Laborde Products was selected as Vapor Power International Marine Distributor for the North American marine markets. The announcement was made at the 2013 International WorkBoat Show. "The Vapor Power heaters really complement our growing position in the inland tank barge industry," said Doug Oehrlein, Laborde Products' VP sales & marketing. "The Mitsubishi powered mechanical tank barge power units and the Vapor Power heaters are the right product for our heater barge customers," said Oehrlein. Chris Cerullo, Laborde's marine manager. "We can now provide our customers with a complete stainless steel package including generators, barge pump package and Vapor Power heaters." The new relationship also positions Laborde to provide the Vapor Power heater product support through the company's three branch offices and 17 marine dealers. Vapor introduced thermal fluid heaters in the late 1950s and by the 1970s Va-Power, as it was known, became the leading supplier of cargo heaters to the marine industry. In 2001, the current ownership purchased the Va-Power division and Vapor Power International was formed with a focus on heating products. The Vapor Power products afford customers with capital cost savings, construction cost savings, fuel cost savings, a compact design, faster heat up times and ease of operation. Vapor Power's relationship with Laborde stems from Vapor Power needing a strong partner in the marine market to reintroduce its brand. 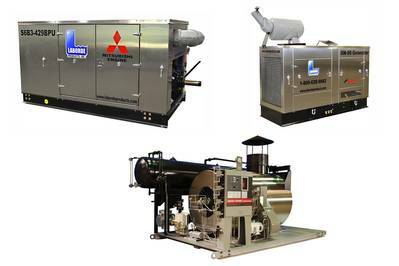 Laborde Products is the largest distributor of Mitsubishi Marine engines in North America. As an engine distributor, the company has developed a range of products targeting the inland marine market and specifically the tank barge market. Laborde's tank barge power units, which are powered by the only Tier 3 Marine Mechanical engines in the market, enable Laborde to provide power to their customers' units that meet the USCG Class 1 Division 1 requirements without complex electronics. A host of issues associated with electronic engines and cost are avoided with the use of a reliable Mitsubishi mechanical engine.